Chick-fil-A opened its doors in Manhattan on the corner of 37th and 6th six months ago. 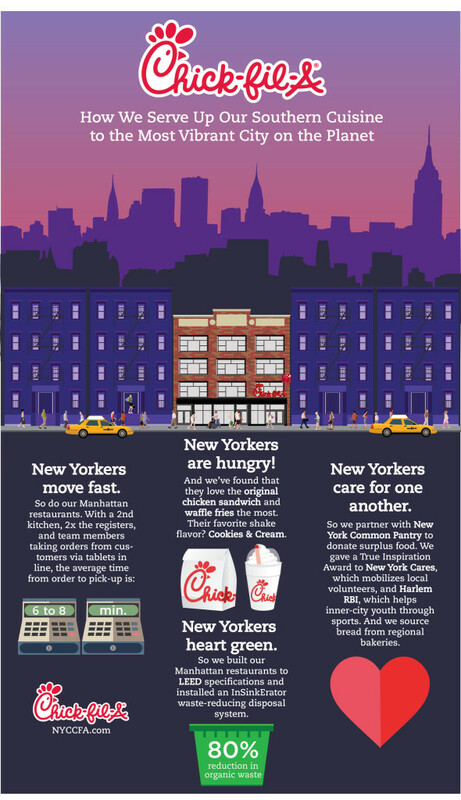 During that time, New Yorkers have been eating more chicken—so much so, that the second restaurant at the crossroads of 46th and 6th opens April 2. The City That Never Sleeps has Manhattan restaurant owner-operators Oscar Fittipaldi and Al Puglisi modifying prep and delivery methods to serve New Yorkers in the fashion to which they’re accustomed: fast. From partnering with New York organizations, to discovering what meals matter most to the new restaurant’s intown neighbors, it’s a pleasure doing business inside the Big Apple.